An important early artillery fortification with an exceptional residential tower, Craignethan Castle is in a very picturesque setting overlooking the River Nethan. 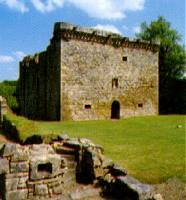 Craignethan dates back to around 1530. The oldest part is a tower house built by Sir James Hamilton of Finnart, the castle's defences include a caponier and a stone vaulted artillery chamber, which is rare in Britain. Five and a half miles west north west of Lanark off the A72.